Heat oven to 350°F (325°F for dark or nonstick pans). Place paper baking cup in each of 24 regular-size muffin cups. Make cake mix as directed on box for 24 cupcakes, using water, oil and eggs. Bake as directed. Cool in pan 10 minutes; remove from pan to cooling rack. Cool completely, about 30 minutes. Cut licorice into desired size pieces. 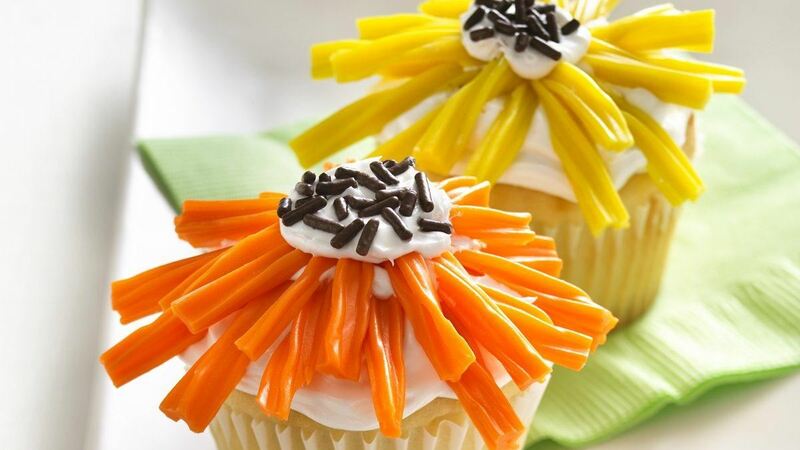 Create flower shapes with licorice; arrange on cupcakes. Sprinkle candy sprinkles in center of each flower. How-To: If you have only one 12-cup muffin pan, cover and refrigerate the rest of the batter while baking the first batch. Then bake the remaining batter in the cooled muffin pan, adding 1 or 2 minutes to the bake time.